HobbyPress have published a short book focusing on the practical side of game creation using Game Maker 8. Game Maker 8 Game Creation – Practical Tips & Techniques Vol.1 has 162 pages. “The goal of this book is to provide starters with rich technical information so the best decision and judgment can be exercised when creating games through GM8. At $13.95 on Amazon this is probably the cheapest Game Maker focused book available today. 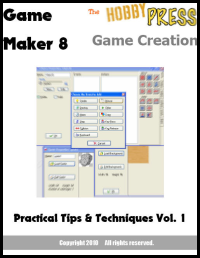 A review of Game Maker 8 Game Creation – Practical Tips & Techniques Vol.1 will be posted within a couple of days. Jacob Habgood and Mark Overmars’ follow up to the successful Game Maker’s Apprentice, titled The Game Maker’s Companion aimed at intermediate level developers is due to be released in April this year. In July 2009 Course Technology published Jerry Lee Ford’s book Getting Started with Game Maker: Review. Author Interview. The cover needs to be inverted. Oh, and add some lens flare! Yes, that cover is awful. The publishers must have been out of their minds to let a cover like that grace the book. I can’t comment on the content because I don’t own the book. I agree with Manuel. Sounds cool but I’m going to have to judge this book by its cover. Sounds interesting, but that cover looks like is made on MS Paint.